The Deni Uke Muster Festival began in 2013. Held in November each year, it's aim is to bring together ukulele lovers for fun, friendship and a bit of learning. Running from a Friday evening 'open uke night', participants enjoy three 90-minute workshops by experienced local, regional and interstate presenters, lots of ukulele playing, a concert by workshop presenters and all meals (except breakfast) until Sunday afternoon. 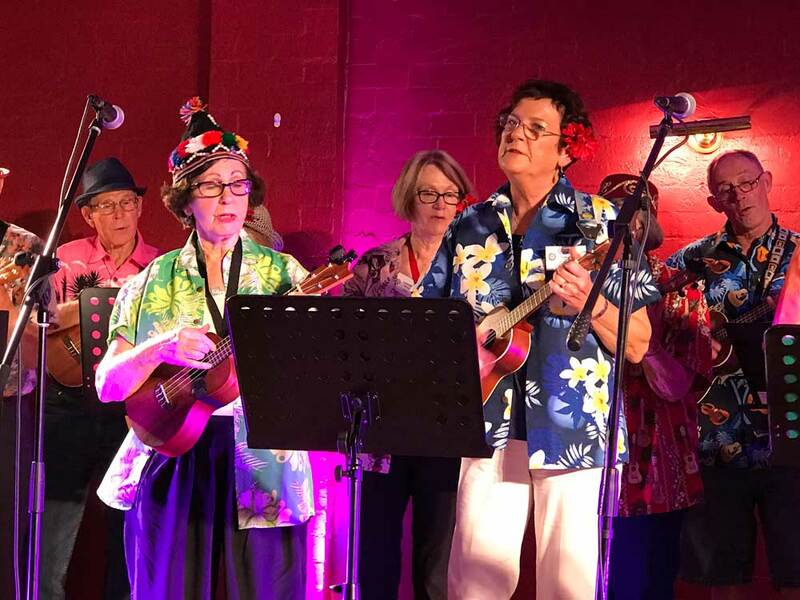 You don't have to be a skilled ukulele player to attend and there are workshops for all levels but it is expected that you have played the ukulele before and know at least four chords. Festival headquarters is the Deniliquin Club in George Street, Deniliquin. This is the venue for the open uke night, showcases, some workshops, hanging out between activities and lunches. Workshops are held at various venues around Deniliquin depending on availability, including the Multi Arts Centre and Sunday School, the CWA rooms and the Deniliquin Neighbourhood Centre. The Saturday night dinner is held at The Crossing Cafe in George St, Deniliquin. People registered for the festival can bring a partner or guest who can attend all meals, the open uke night and the dinner concert. In 2018 this cost is $95 per person. Who are the workshop presenters? The closest RV-friendly sites (limited to 72 hours stay) are at Civic Place and the Davidson Street Rest Stop (in North Deniliquin). If you want a scrumptious sit down breakfast with all the trimmings and a decent coffee, 'The Crossing' is the place to go. It's open Saturday and Sunday from 7.15am where it's the busiest place in Deniliquin. If you have a large group, it's best to make a booking. Bronte's do a simpler sit down menu and breakfast to go and have good coffee. It's open Saturday from 8am until 1pm. Relatively new to town, Sushi Bite has made its mark as a healthy and delicious place for lunch. It has fresh juices, superfood smoothies, nori rolls, salads, yoghurts, fruit salad, smoothie bowls, homemade raw, vegan treats and good coffee. Open Saturday from 8am until 2pm.